Ask fellow campers about "Teeter's Campground" and nearby attractions. Stayed 2 weeks to do some surf fishing. Make reservations! Our Name and site number was on a check-in board, so we could get parked. Cash or check payment. Very quiet and easy to get to the harbor. Marina area has golf cart rentals. Lots of seasonals but not a problem. Very nice owner. 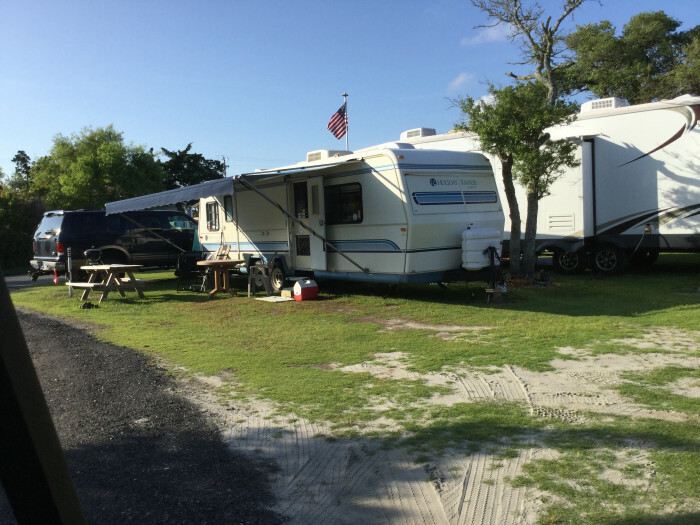 The only campground on Ocracoke with electric. We hope to come back this year. We camped at Teeter's Campground in a Motorhome. Many good places to eat dinner. We liked Gaffers and the Oyster Company. Small local shops and a variety store. This a great little park filled with southern hospitality. Convenient to the center of Ocracoke Village. This is not a resort campground, this is an island campground and sites are a little tight. 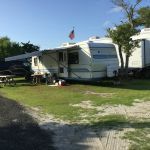 Property is well maintained, the owner is friendly and its great place to vacation in Ocracoke. Will definitely be back in the near future. We camped at Teeter's Campground in a Travel Trailer. This park is convenient to the Cedar Island ferry. It's an ok place, nothing remarkable. Cash only payment. No credit cards. We camped at Teeter's Campground in a Motorhome. We parked our motor home here after Labor Day when the park was half empty. Our site was grassy and open. Others were under trees. Most of the park were permanent seasonals, so reservations would be necessary in the summer. I think that only the seasonals have sewer connections. This park is very convenient - directly next to the British Cemetery and within walking distance to the Deepwater Theater. The park is also within walking distance of the public library which has Wi-Fi and computers to use. We camped at Teeter's Campground in a Motorhome. We would not stay here again except in case of emergency. We thought this would be the perfect place for a night stopover before heading further north on the OBX. But right on arrival we were attacked by large mosquitoes and counted more than 10 bites while parking the trailer. The site was swampy with a grass cover, very unlevel and the electric hookup had no breaker. Access to the site from a public road (not very busy but still unacceptable to me). The village is quaint and easy to access from the campground. When leaving on the next morning it took me 10 minutes and a phone call to find somebody who would collect the rate. My overall impression is that this campground is meant for permanents and not for travellers. We camped at Teeter's Campground in a Fifth Wheel. Actually this campground is in someone's backyard. Price is right and you can walk to anything in the village but don't expect any amenities except electricity and water. We camped at Teeter's Campground in a Travel Trailer. "Mosquito-infested swamp" is the description that first comes to mind. We arrived one day after a rain and most of the place was flooded. Stayed one night with little change in drainage. No sewer hookups were available. The sewer system consists of a network of above-ground pipes, all of which seem to run to the "permanent" residents. The power hookup was an outlet with no circuit breaker. The proprietor has a full-time job elsewhere, so it is extremely difficult to get him on the phone. We would not stay here again. We camped at Teeter's Campground in a Motorhome. Teeters is not a resort Campground, far from it. It is a decent place to put your camper within walking distance of mostly everything. It has no amenities but it is quiet and certainly has charm. I always liked the place and will return. This is a great island to walk around and relax and slip into an "Ocracoma". If you are looking for fancy and fast paced, Keep Going! We camped at Teeter's Campground in a Fifth Wheel. This campground is inexpensive. Only $25 a night for water and electric. This was our second time here. It is located in the center of it all in Ocracoke. Basically, it is a good place to park your rig. The sites have good grass, but watch out for the sand burrs. It is not a resort campground, but you do get what you pay for. A nice campsite with water and electric. Our friends camped with us in a 40ft. motorhome and were able to get in a site. Bring cash, no credit cards. We camped at Teeter's Campground in a Motorhome. Are you affiliated with Teeter's Campground ?